A Goodbye from a Member of the MCR Team and an Introduction! Fans who frequent My Chemical Romance's website or who were members of the band's MCRmy Street Team are probably familiar with Mikael, or - as he was known to street teamers - the mysterious "TSN Ninja." 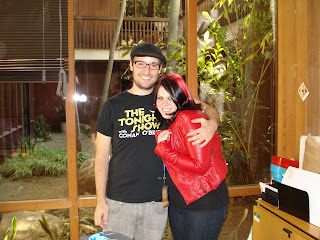 Today, Mikael announced that after his 4 years working at WBR with My Chem, he will be moving on. There is a tremendous amount he did for MCR and for the fans for which he can never be thanked enough, and he will certainly be missed. I think Brandi from MyChemicalFreak who met Mikael with me in November said it very well: "For those of you who didn’t know him, well you missed out. He cared more about the fans than anyone ever could have." I feel very fortunate to have met someone so hard-working, passionate and inventive, and we - as a fanbase - were very lucky to have had someone who cares about us and My Chemical Romance as much as Mikael. 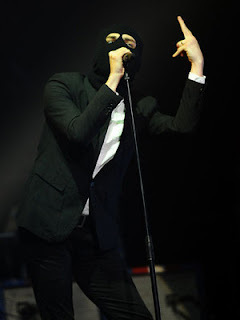 My Chemical Romance, who were nominated for 5 Shockwaves NME Awards, picked up two of them tonight and surprised the crowd with a masked performance. "We want to thank every fan that voted for us. Don't ever let the media tell you what your body is supposed to look like, you're beautiful just the way you are. Keep it ugly. "Fans who are familiar with NME's November 2010 issue will recall that the band were none-too-pleased when they read that the writer had described guitarist Ray Toro as having "doughy lovehandles" in a feature article about the band. Key Tracks: "If You Think This Song Is About You, It Probably Is," "Graveyard Dancing" & "Laminated E.T. Animal"
My Chemical Romance are set to shoot their video for "Planetary (GO)!" this Thursday, February 24, at London's O2 Academy Islington. The video will involve U.K. fans who are lucky enough to acquire tickets to what is described as the "assault party" video shoot. Fans with tickets are encouraged to come wearing their Killjoys colors and apparel! According to the U.K. TicketWeb event page, tickets (limited to 2-per-person at £4.00 a piece) will go onsale tomorrow at 9 A.M.
My Chemical Romance also announced that they will return to the U.K. for summer festival "T In The Park" in July. Tickets go on sale Friday 9 A.M. U.K. time through the T In The Park website. 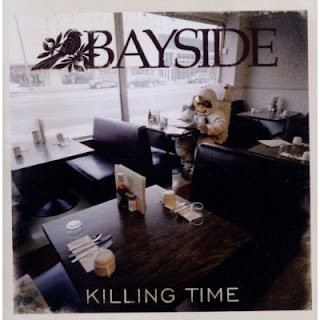 Key Tracks: "Mona Lisa," "It's Not A Bad Little War" & "Sick, Sick, Sick"
Four tracks into Killing Time, I knew Bayside's latest effort would be my favorite of their albums. Past releases have featured strong tracks as singles that were the few I kept around as iTunes library-worthy while I found the albums as whole works to grow monotonous by the end. However, Killing Time is an album from which I could see myself hanging onto more than a few tracks permanently. It doesn't hurt that it is a mere 10 tracks long and is able to hold interest through all. I know a lot of you don’t understand how I can love a band this much. I know many of you think that it’s funny because of how often and blatantly I express it, or you think that it’s something silly I waste my time on. I’m a “walking billboard,” I’ve been told because I wear something MCR-related every day. That’s what you see on the outside. In a way, it is funny, but - on the other hand - it’s nothing close to a joke to me. Those clothes on the outside are like armor, badges I wear in honor of something that has helped me infinitely. The truth is, this is what gives me the will to get out of bed every day. This is the reason I lived past the age of 14. My Chemical Romance inspires me EVERY. SINGLE. DAY. to better myself, to try to better the lives of others and reminds me that I should never settle for anything I’m less than passionate about. 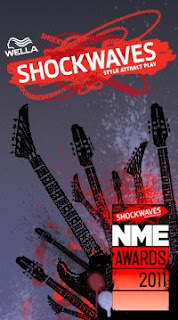 My Chemical Romance are set to play the Shockwaves NME Awards Ceremony alongside Foo Fighters in London on February 23. Vocalist Gerard Way alone is nominated as "Hero of the Year." Sorry for the late post on this. I know the information's been out for a while. I wanted to put it up closer to time for the awards. My Chemical Romance's "Planetary (GO! )," which has gained ground in the video game world as the lead-in track for the driving game Gran Turismo 5, will be released as a single March 21, according to a blog post on the band's website. The single is set for release following the UK leg of the band's World Contamination tour. The UK tour - as announced in the same post - will feature LostAlone, who opened for the MCR's two Roxy shows in 2009, and The Blackout as openers.